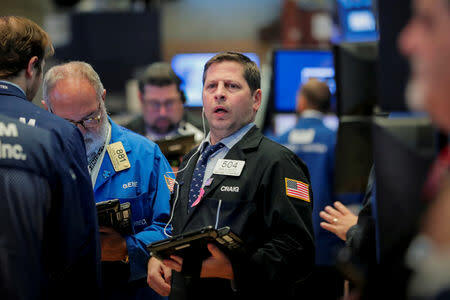 NEW YORK (Reuters) - Stocks across the world bounced back on Tuesday, supported by strong earnings results and expectations, while oil prices rose as evidence of higher U.S. production was overshadowed by concerns about supply from Iran and Saudi Arabia. Despite the rally in stocks, U.S. Treasury yields were little changed. European shares pulled up from Monday's 22-month lows, partly on expectations that the reporting season will deliver double-digit earnings growth. A rebound in Italian assets helped battered equities find firmer ground. On Wall Street, tech shares led the way a day after a decline in Apple weighed on the Nasdaq, while the healthcare sector rose after earnings reports from Johnson & Johnson and UnitedHealth Group. Willie Delwiche, investment strategist at Baird in Milwaukee, said Tuesday's gains were the result of sharp selling over the past weeks. "The degree of the move is a function of the moves we have seen already this month more than anything else," he said. Crude futures rose in choppy trading as expectations of higher U.S. shale output and inventories were more than offset by worries over looming U.S. sanctions on Iran and growing tensions with top oil producer Saudi Arabia. U.S. crude rose 0.07 percent to $71.83 per barrel and Brent was last at $81.32, up 0.67 percent on the day. Sterling rose against the dollar after data showed basic wages of workers in Britain rose at their fastest pace in nearly a decade. The British currency was last trading at $1.3187, up 0.28 percent on the day. The euro fell 0.03 percent to $1.1573, while the Japanese yen weakened 0.47 percent versus the greenback at 112.30 per dollar. The dollar index rose 0.01 percent. Investors waited for Washington's view on China in the U.S. Treasury's semiannual currency report due this week, after media reports last week that it has not labelled Beijing a currency manipulator. The 30-year bond last rose 6/32 in price to yield 3.3312 percent, from 3.341 percent late on Monday.